Can with success be combined with a promoter from pBAD SPL to obtain a very low leakiness and an appropriate strength. This is very efficient for expressing lethal proteins. Can be used for diauxic shifts with appropriate media as the promoter has a CAP binding site and thus shows catabolite repression with glucose [IISc Bangalore, 2016]. The sequence was listed as inconsistent, and the ligations of parts behind the promoter failed. Restriction of isolated plasmids showed fragments of unexpected sizes. 2010 iGEM team Slovenia further characterized the pBAD/araC promoter (Part:Bba_I0500) using lacZ gene that encodes for beta-galactosidaze enzyme (Part:Bba_K323133). pBAD promoter is an arabinose inducible promoter. When incubating E.coli cultures containing the lacZ under pBAD/araC promoter, increasing concentrations of arabinose leads to higer promoter activity that results in higher amounts and subsequently higer activity of beta-galactosidase enzyme as seen from figure below. The resulting graph shows a trend of increasing beta-galactosidase activity over increasing concentrations of arabinose. 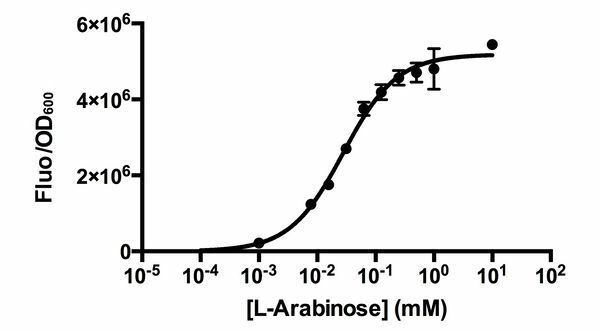 Beta-galactosidase activity of cultures with different concentrations of arabinose increases with raising the arabinose concentration. The tested cultures incubated at different concentrations of arabinose (i.e. 0%, 0.001%, 0.0025%, 0.005%, 0.01%, 0.025%, 0.05%, 0.1%, 0.25%, 0.5%, 0.75% and 1%) have shown a trend of increasing beta-galactosidase activity with raising arabinose concentration. 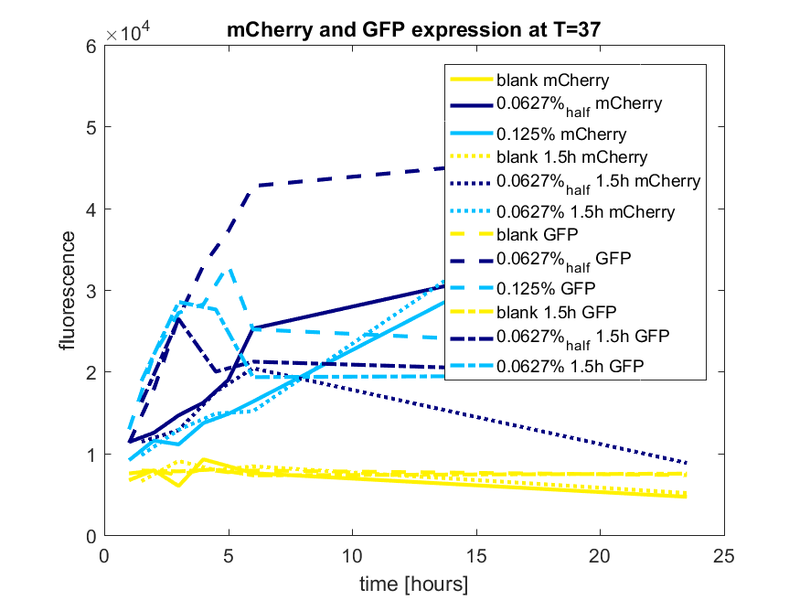 The activity was highest at 1% added arabinose, which implies the promotor should be induced by this arabinose concentration for reaching maximum expression of the regulated protein. However, some beta-galactosidase activity was observed even at 0% added arabinose, which indicates slight leakage of the pBAD promoter. pBAD/araC_lacZ_DTER construct (Part:Bba_K323133) includes a beta-galactosidase (lacZ) gene, the expression of which is regulated by the pBAD promoter (Part:Bba_I0500). This construct was designed for the sole purpose of characterising the pBAD promoter with the beta-galactosidase assay (for a detailed description of the method see the 2010 iGEM team Slovenia wiki). 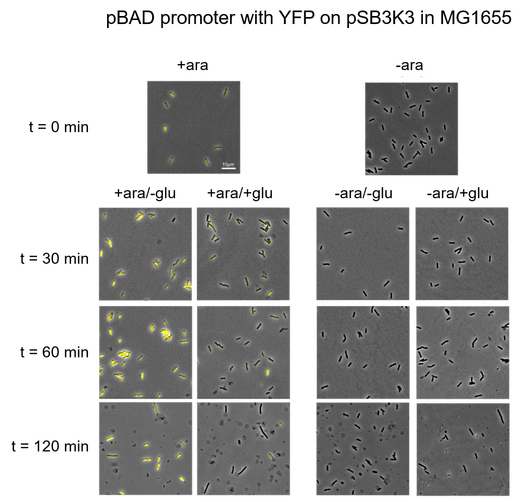 2011 iGEM team Groningen characterized the pBAD/AraC promoter (Part:Bba_I0500) even further using GFP and measuring the fluorescence in a fluorimeter over time, utilizing different arabinose concentrations to induce the promoter. After analysis of the obtained data (see graphs below), it is clear that the induction is faster and stronger with higher arabinose concentrations. It shows a dynamic response over a range of arabinose concentrations and over time. Because of that it can be treated as a precise tool capable of giving different output levels. The measurements were done in DH5alpha strain carrying a pSB1C3 with BBa_K607036 in triplicate. Figure 1a. Cells carrying a pSB1C3 plasmid with BBa_K607036, induced at time=0h. Figure 1b. Wild type cells, induced at time=0h. Figure 2a. Cells carrying a pSB1C3 plasmid with BBa_K607036, induced at time=0h. Figure 2b. Wild type cells, induced at time=0h. We observed an 'all-or-nothing' response in our use of the pBAD promoter. We grew up cells of the strain BW27783 overnight at 37°C. We then diluted the culture 10-fold and grew the cells back up to an OD_600 of 0.5 to catch the cells in mid-exponential phase. We then induced with arabinose at various concentrations from 0.001mM up to 10mM and took OD and GFP readings on a plate reader over the next 20 hours. During this time the cells were held at 37&degrees;C. The cells contained our ReflectinA1-sfGFP and TorA-ReflectinA1-sfGFP constructs on pSB3K3 plasmids. In contrast to the Groningen team we observed an 'all-or-nothing' response, with very little fluorescence at [ara] of OM or 0.001mM and high fluorescence readings at 0.01mM or above, with little difference between the readings. This paper reports that response to arabinose is highly variable between different strains of E coli. Induction also altered the growth pattern of our cells. The fluorescence readings need to be corrected not just for OD but also for cell state. Note: 1mM arabinose corresponds to 0.015% w/v. center | 600px | OD readings of cells carrying K638301 on a pSB3K3 backbone, after induction with arabinose at time 0h. center | 600px | GFP fluorescence readings of cells carrying K638301 on a pSB3K3 backbone, after induction with arabinose at time 0h. center | 600px | OD readings of cells carrying K638403 on a pSB3K3 backbone, after induction with arabinose at time 0h. center | 600px | GFP fluorescence readings of cells carrying K638403 on a pSB3K3 backbone, after induction with arabinose at time 0h. We were unable to extract this part from the distribution kit, so we developed our own! Please head to BBa_K731201 for documentation and characterization. 2014 HKUST iGEM team previously submitted characterization data of Part BBa_I0500 that described an all-or-none behavior of the promoter. That is however not the case. We sincerely apologize for the misleading information. Please refer to our latest characterization data by HKUST-Rice 2015 below instead. HKUST-Rice Team characterized BBa_I0500 using the construct BBa_I13540 in low copy plasmid pSB3K3. 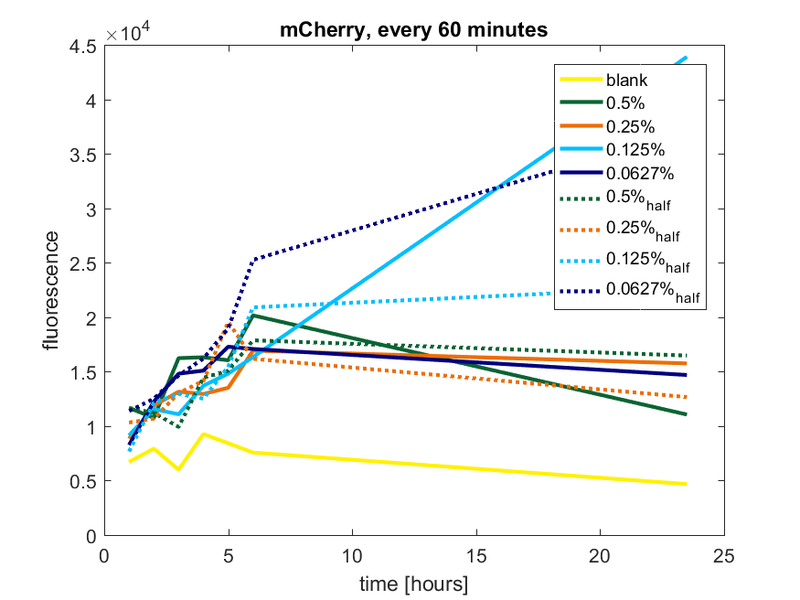 We aimed to obtain a dose response curve capturing the dynamic range and maximum induction concentration in order to compare its behavior when it is expressed in parallel with another sensor. (please see BBa_K1682017 for more details. Figure 1. Dose response curve of cells carrying pSB3K3-BBa_I13540 under increasing L-arabinose concentration. Fluo = Relative Fluorescence Units. Error bars represent SD (n=3). Results indicate that the sensing range of BBa_I0500 lies at roughly 10-3 to 10-1 mM and has a half-maximal induction concentration of around 3-2mM of Arabinose. Characterization was done using E. coli strain DH10B. Overnight inoculated cell cultures in M9 supplemented medium with corresponding arabinose concentrations were diluted 20 fold in medium with arabinose the next day. 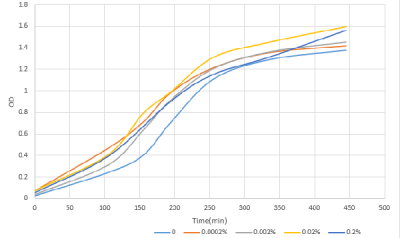 Measurements for population-averaged assay using fluorometry were taken after 5.5 hours of induction and incubation at 37°C when the OD600 was around 0.3-0.4. We have also fixed characterization data from last year for the construct BBa_I2031 on low copy plasmid pSB3K3 and high copy plasmid pSB1K3. In BBa_I2031, BBa_I0500 is driving expression of a reporter GFP in which translation is initiated by medium RBS BBa_B0032). Our results demonstrated that this promoter has a graded induction response and different sensing ranges on plasmids with different copy numbers (Figure 2). In concordance with literature, it displays an all-or-none behavior on a single cell level when expressed from a high copy plasmid pSB1K3, but not when expressed from a low copy plasmid pSB3K3 (Figure 3). Figure 2. Transfer curves for BBa_I2031 on plasmid pSB3K3 and pSB1K3. 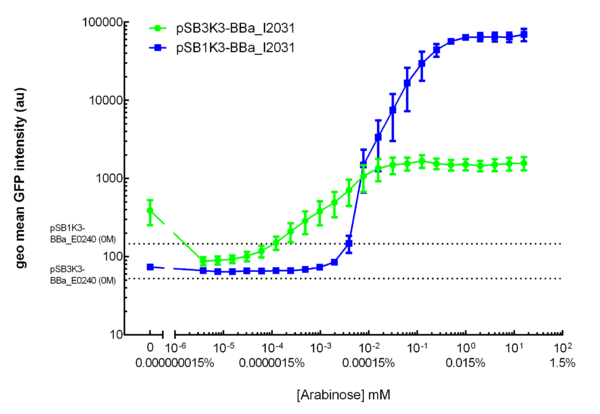 On pSB3K3, BBa_I0500 is responsive to 10-4 - 10-2 mM arabinose, whereas on pSB1K3, it senses arabinose from roughly 10-3 to 1mM. These data agreed with neither Cambridge 2011 nor Groningen 2011’s result. The dashed lines represent cells’ auto fluorescence, measured using DH10B cells harboring pSB3K3-BBa_E0240 or pSB1K3-BBa_E0240. Error bars represent SEM of 3 independent experiments on 3 different days. 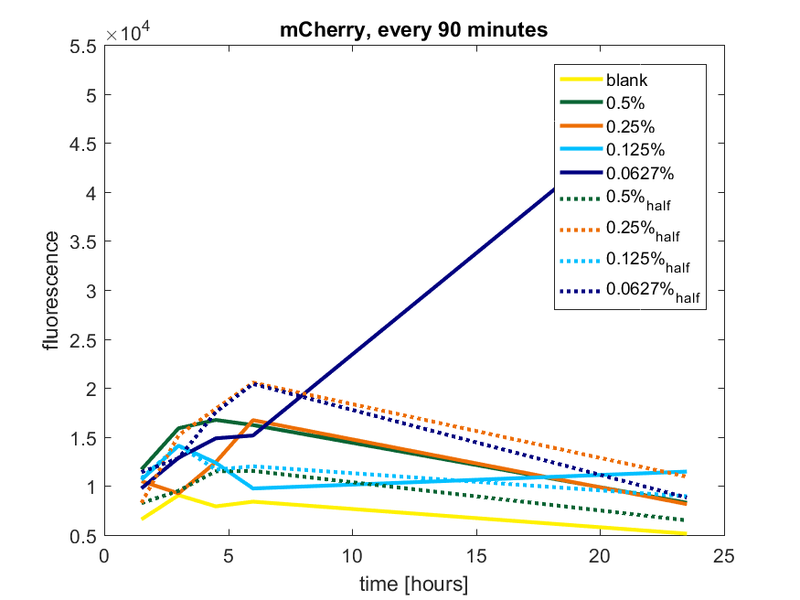 The molar concentration to percentage conversion was provided for comparison with previous data. Figure 3. 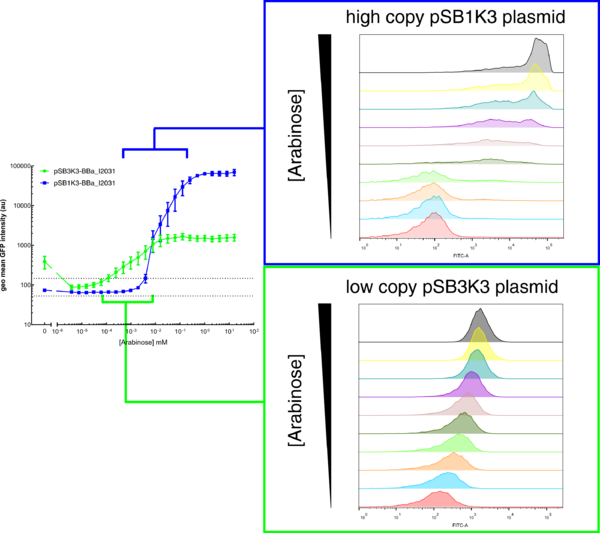 Histogram plots for sensing ranges of BBa_I0500 on high and low copy plasmid. An all-or-none induction can be observed when BBa_I0500 is placed on a high copy plasmid, where induced cells were mostly distributed among two bins of fluorescence. Yet on low copy plasmid, the induced populations remain homogenous along the arabinose concentration gradient. 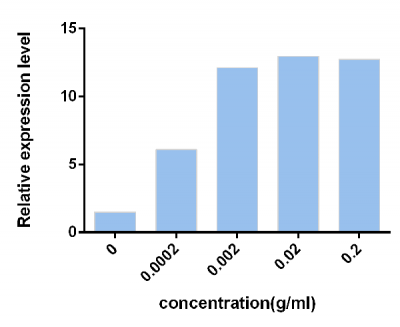 Concentrations of arabinose for high copy pSB1K3 plasmid: 0.488µM – 0.25mM. For low copy pSB3K3 plasmid: 0.0610µM – 0.03125mM. Only 1 set of experiment result from 3 replicates is presented. Moreover, we would like to warn potential users of this part not to drive expression of riboregulators (Isaacs et al., 2004) using BBa_I0500. This PBAD promoter contains a 19bp sequence after the transcription start site, which would produce a taRNA with additional nucleotides at its 5’ end, and rendering it incapable to activate crRNA. To avoid misuse of this part due to incognizance of its sequence information, we recommend users to look up BBa_K1067007 for annotations. For more information and methods of our characterization, please refer to our detailed characterization report available through our wiki page. IISc Bangalore characterized BBa_I0500 by using Bba_746908 which has sfGFP under the pBAD/araC promoter. We wanted to verify the catabolite repression of the expression from the promoter in the presence of glucose. 0.5mL samples were collected every hour in microfuge tubes and stored at 4C and the flasks were incubated at 37C, 180rpm. OD600 and fluorescence values of the samples were recorded. The data was plotted and the plots are shown. This is the expected trend as arabinose induces expression from the promoter in the absence of glucose (CAP site occupied by CAP-cAMP complex) and in the presence of glucose (independent of the availability of arabinose), the expression from the promoter is greatly repressed due to the low concentration of cAMP inside the cell, however, the expression in glucose + arabinose will be slightly higher than just glucose as there will be more sites occupied by CAP-cAMP complex in glucose + arabinose than in glucose. In the blank (LB broth) very low concentrations of glucose and arabinose are present and the expression from the promoter will very low. The above trend is exactly in accordance with the information available in the literature about pBAD/araC promoter, thus, we verified for the biobrick Bba_I0500 that catabolite repression is seen, glucose is a repressor and also indirectly verified the presence of a CAP site in the biobrick. OUC-China characterized BBa_I0500 of different concentrations of L-arabinose on the transcriptional level. We found that the strength of I0500 was mainly measured on the translational level before. As far as we are concerned, it is the transcriptional level that can directly reflect I0500’s original strength without interfering by context. In order to verify it more accurately, we tested it on the transcriptional level by extracting RNA and measured it by qPCR. We constructed I0500 with GFP(E0040) and transformed into TOP10F’. Firstly , we plated on LB agar with chloramphenicol and individual colonies were subsequently grown overnight in LB-medium. Cultures were back diluted 1:100 into 100mL fresh LB-medium with chloramphenicol, adding 0,0.0002%,0.002%,0.02%,0.2% (m/V)L-arabinose. After growing for 18 hours, we extracted RNA and measured it. 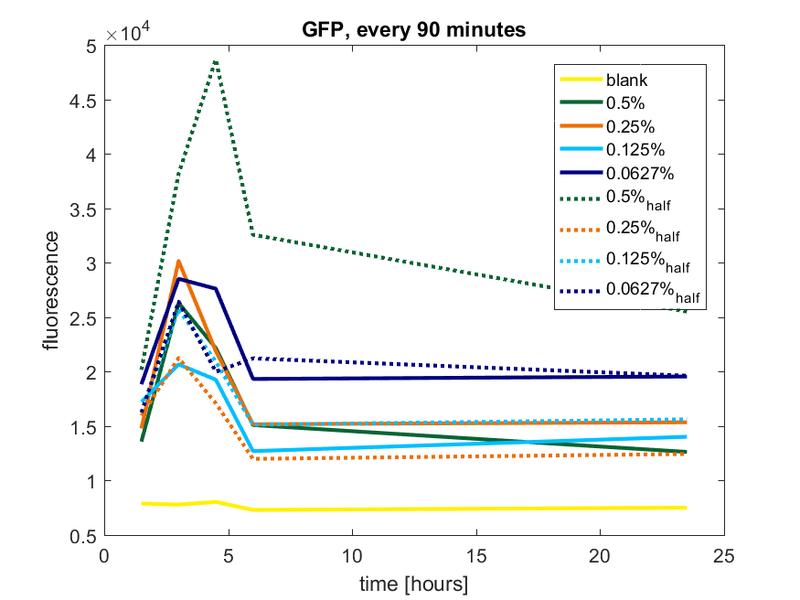 At the same time, we measured the fluorescence of GFP(485nm/520nm). Besides, we also measured OD over time to check whether L-arabinose promotes bacteria’s growth. 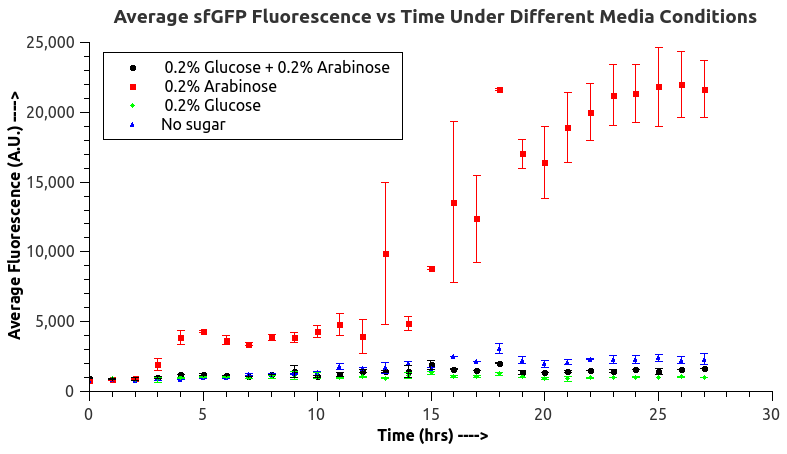 Figure2 The relative expression level of GFP after induction with different concentration of L-arabinose. According to our data analysis, when induced with 0.02% arabinose, our strain TOP10 was effected better than that induced with 0.2% according to the previous research. We infer that 0.2% arabinose may affect the growth of our strain. So, in the future, we suggest others to use this concentration to induce the TOP10. Team Glasgow 2017 improved this part by splitting its constituent parts into two separate BioBricks: BBa_K2442101 encoding minimal pBAD and BBa_K2442104 encoding AraC under regulation of LacI-regulated promoter. This allows for greater control over arabinose-inducible systems. Placing AraC under control of LacI regulated promoter (R0011) allows to induce expression of AraC only when required, taking translational load off grown cells. R0011 is inducible by IPTG. AraC coding sequence alone is also available as part BBa_K2442103, which can be placed under other promoter of choice. We isolated the minimal DNA sequence from the native pBAD that is sufficient to retain its function. The promoter retains all the operator sites O1, O2, I1 and I2 required for binding of AraC. As some of these sites lie within the PC promoter and overlap with AraC coding sequence, the minimal pBAD has the araC start codon ATG mutated to AGT to prevent the protein from being made. See part BBa_K2442101 and our wiki for details. We tested pBAD with the use of pBAD+GFP reporter plasmid (BBa_K2442102) by measuring fluorescence. Activity of the promoter was tested in presence of arabinose, xylose, decanal and no inducer (Fig. 1). When transformed into AraC-positive E. coli strains such as DH5α, pBAD is sufficiently activated with just the chromosomal copy of araC and does not require introduction of araC from external plasmid. Moreover, DH5α cells carrying K2442102 showed fluorescence in presence of arabinose, but no significant increase in fluorescence in other conditions, showing high specificity of AraC and minimal leakage of minimal pBAD. DH5α carrying pBAD+GFP reporter on a high copy number plasmid (pSB1C3) BBa_K2442102 showed 2000x fold increase in fluorescence on arabinose plate compared to empty cells (Fig. 1). This proves significant improvement of part BBa_I0500. DH5α cells carrying minimal pBAD and I13500 on a low copy number plasmid pSB3K3 instead of pSB1C3 also showed expression of GFP only under arabinose conditions. 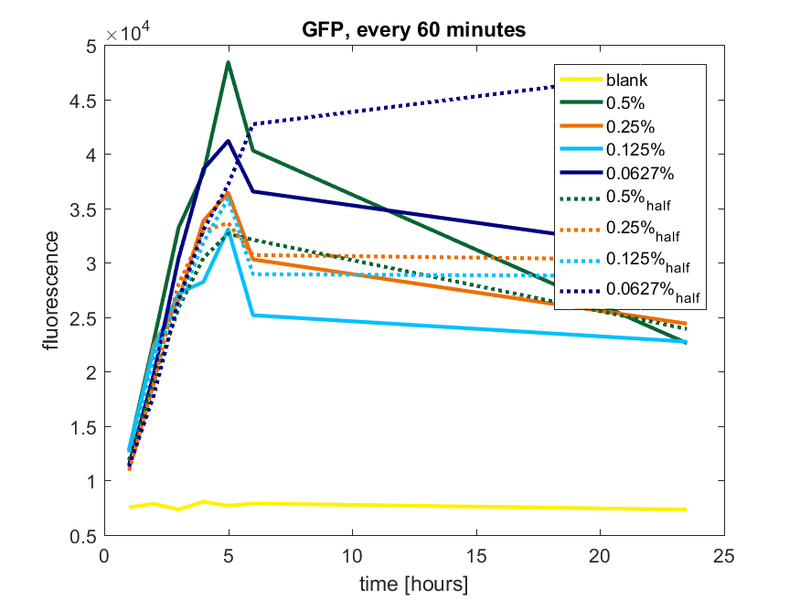 However, levels of fluorescence were much lower, suggesting that the level of GFP production is dependent on the plasmid copy number and must be taken into account in further experiments. In AraC-negative strains, AraC expressed from BBa_K2442104 induces pBAD with similar efficiency. Overall, results show that both AraC and arabinose are necessary to activate pBAD. Efficiency of minimal pBAD is demonstrated by 2000x fold increase in fluorescence of cells carrying the reporter plasmid. We first tested three different temperatures, being 20, 25 and 37 degree Celsius. From our fist basic measurements, we discovered that expression was more efficient at a temperature of 37 degree Celsius and continued with this setting on our incubator. The next step was consequent adding arabinose to the cultures, as E. coli BL21(DE3) is a strain that can break down arabinose, and for an optimal expression, it is better to have a high enough constant concentration. We tested an addition of every 60 minutes and every 90 minutes, with varying concentrations of arabinose. The percentages that are depicted in the figures are the total concentration of arabinose in the whole culture. The indication half means that we added 50% of the original added amount of arabinose compared with the first addition. This was done because we expected that a higher initial dose was needed to induce the expression, but that not all added arabinose would be broken down, and we therefore didn't need to add a high amount of arabinose. The results of all our tries are depicted in Figure a1 & a2 with the best results in a3. The results of all our tries are depicted in Figure b1 & b2 with the best results in b3. The best results are depicted in Figure c.
We advice to use a consequent addition of arabinose in a low concentration if you want to have a high expression of the protein. As this is very labour intensive, we advice to use another vector if you want to have a high expression of a certain protein. We therefore advise the usage of pET28a, which is induced with IPTG. The reason we choose to use pBAD was because we planned to do a double transformation, which required different antibiotic resistance and different promoters.